Holi Aioli is the perfect mayo replacement, giving you a tasty way to top off sandwiches, dip veggies or french fries, top off salads, and marinate vegetables or meat alternatives with this deliciously versatile condiment. 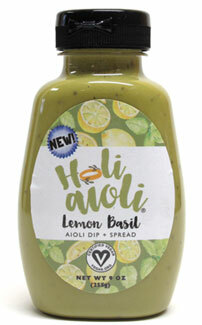 Made with plenty of basil and the perfect balance of lemon, Holi Aioli brings exceptional flavor to whatever you put it on. With roughly half the fat of regular vegan mayon and only 60 calories per tablespoon, you won't feel guilty when you squeeze it on your favorite foods for a burst of delicious goodness that makes everything better! 9 oz. (255g) squeeze bottles are $8.49 each.